Noor Haikal wins TFAS Future!! 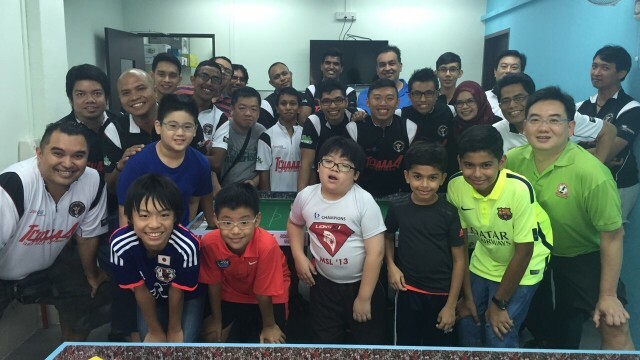 The TFAS Future – only for players ranked below 300th in the FISTF World Rankings – was held at the home of Jurong Central Subbuteo Club on the 17th of May 2015. A total of 23 players took part in this competition. Players were drawn into 5 groups of 3 players and 2 groups of 4 in accordance to the FISTF regulations. The 7 seeded players took their places in their respective groups according to the latest available FISTF world rankings which saw Rizal Taib took the 1st seed spot at group A. At the end of the group games, the top two players of each groups qualify for the next round while the bottom 2 went to play in the plates. There was no upsets in the group stages where all the seeded players went through to the next round even though they encounter tough challenges from some unexpected players in their respective groups. The plates event went extremely well where the players who are knock-out from the group stages were given a chance to redeemed themselves in an another event. The Plates final was between Singapore former U19 champion Azhar and Athur Yeo. It was a very end to end match where both players have their own chances at goal. The interesting Plate finals saw Athur Yeo won Azhar by 3 goals to 1. This deserving win saw Athur winning his first silverware in this sports. The Futures main event has an interesting twist right from the barrages stage where we saw some of the top seeded players being knock-out. One of the key matches of the barrages was between two seeded players, Amin and Chandru faces of with each other. It was a very tight game which saw Amin won by just a goal to qualify for the quarter finals. 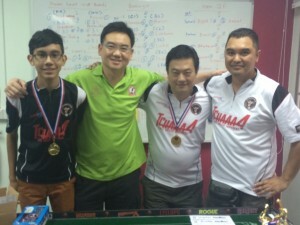 Seeded players, Isaac was also knock-out by one of the veteran player, Sunil. Quarter final was even more exciting where we saw a top seeded player of the tournament, Rizal Taib was knock out by Noor Haikal. 2 more shocking results which saw young Bharvin beat veteran Sunil by 2 goals to nil. His younger brother, Ruhan did not dissapoint too as he beat senior and seeded player, Amin to a goal to nil. Both of them who were both under the age of 16 shows what a talent they had in this sport and what a bright future for Singapore Table football. The Semi Finals was a tough match for the two brothers, Bharvin and Ruhan who were match-up with a more senior players, Henry and Noor Haikal respectively. Even though both of them did made a good challenge for their opponent, the more experienced Henry and Noor Haikal won their match respectively with a very respectable scoreline. The finals of the Futures was between Henry and Noor Haikal. Both players with the same playing styles met in the finals of the TFAS Futures. It was a nerve wrecking match where both players trying to get the first goal of the game. Finally the breakthrough was on the 13th minutes of the game where a mistakes by Henry cost him a goal. Second half of the finals saw Henry playing an all-out attack to catch the game but it was backfire as a good counter attack play by Noor Haikal got him another two more goals. The finals end with a result of 3-0 with Noor Haikal crowned as champion of the competition. The undefeated Noor Haikal who scored 17 goals and only conceit 1 goal in the competition was the deserving winner of the competition. The prize presentation sums up the whole competition. 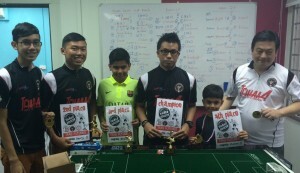 Congratulations to the winners and job well done to the organizers and the outstanding players who made this event a successful one and special thanks to Jurong Central Subbuteo Club for hosting this event. Luke Lim does Singapore proud! !